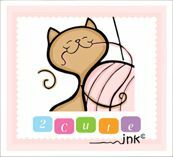 2 Cute Ink is a Sponsor at Kit and Clowder Online Coloring Class. "All About Animals"
All About Animals Online Coloring Class at Kit and Clowder! Alyce does a wonderful job providing tutorials, print outs and feedback in every class. Here is a little more about the class! I hope you stop by and check out this class and all of her online coloring classes! I just loved how Alyce color the Squirrel Present who is pictured above!